Through my years in ministry, I have navigated more “divine opportunities” than I can remember. What I’m about to say is not an exaggeration. It is not an attempt to downplay my leadership or that of our church Elders. In fact, the men and women who have served on our Elder board through the years were willing to pursue what seemed like “divine opportunities” until a door closed or the opportunity became a reality. Every ministry that now exists in our church community started with an individual with a passion and calling to respond to the nudge of God. It is my privilege to occasionally speak to pastors and church leaders. The first question they typically ask is: “How did your church grow from 200 people to over 9,000 people today?” My answer wrecks them. Honestly, the answer to that question might as well end the conference that had lasted about ten minutes at that time. The answer? The people wanted to reach as many people as possible. I didn’t have to convince my people that we were to reach out to everyone. It was more likely they had to convince me to have the courage to lead them where they wanted to go. In other words, the people of the church wanted to radically, sacrificially, aggressively pursue the people in our community who felt far from God. It is a very sad moment for me when I find a pastor so eager and willing to lead a church, yet that church is full of people who don’t want to do anything. Let me talk specifically of one such ministry initiated by a member of the church, Teresa Peden. She and her family were a part of this church when I arrived in 1981. Teresa had a very prestigious career in government. She eagerly helped me begin a few support groups for people struggling with head-spinning issues who needed to know they were in a church that could handle the hard and ugly truth about life, as well as hold out hope for a better future. She took a major step of faith (and a major pay cut!) and joined our staff ten years ago. When she came on board, one of the first things she started was Celebrate Recovery, or CR. CR was started by Rick Warren at Saddleback Church in southern California. This had long been a dream of mine--to pave the way for the local church in Oklahoma to courageously provide ministry to the broken. 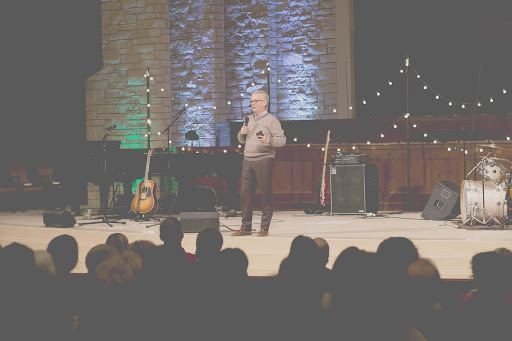 Last fall, we held our tenth anniversary celebration of Celebrate Recovery and over 700 people showed up. These were people who found Jesus, found the strength to face their demons, and, through the power of God, turn things around. There were many people there with their families, families that celebrated making it through the most difficult season they’d ever faced. As I review the various details of our 60th year as a church in this community, I’m reminded of how inadequate I felt when they asked me to be the pastor in 1985. In those fall days of 1985, I got the “seminary” training I thought I’d never get. For the sake of clarification, I encourage ministry students these days to go to seminary. When I finally realized I was going to be a pastor--whether I liked it or not--seminary was not an option unless I left my church and went off to school. Since I assumed my assignment as Senior Pastor would be only a few years at most, it didn’t seem necessary or feasible to leave town to go to seminary. I tell our newcomer classes every month that my seminary education came in a very unusual way within a 90-day period of time in fall 1985. During those 90 days between August and October, Kim and I put our move to another city on hold. I was headed to an Associate Pastor position in a large church. It seemed like a great time to go and a perfect fit for me. We started driving back and forth to that city looking for a place to live. I’d agreed to be the interim pastor in Oklahoma City until the end of the year. Then, we would make the move. In the middle of this interim assignment, I became the Senior Pastor. At the same time, my parents’ marriage of 30 years was coming to an end. As a young 26-year-old, I was forced to navigate and consider the very harsh feelings so many people had toward my dad. In my effort to be what the church needed on Sunday, I was not inclined to be very transparent about this situation with my parents. It wasn’t long before a trusted friend invited me to a 12 Step meeting. As I sat in a dark and very uninviting room in northwest Oklahoma City, my life forever changed. I was stunned as men confessed their sins openly to one another. I watched the men who had achieved sobriety make themselves available 24/7 to those trying to stop and encourage them to call if they were tempted to have another drink. I thought I might explode. I’d heard the Bible verses about confessing your sins, bearing with the failings of the weak, forgiving as you have been forgiven by Jesus. But honestly, I’d never seen it done in church. That day, I was given a very clear picture of the kind of church we needed to be. And that is what we are today. The leaders of our church were so kind and gracious. They allowed me to invite local 12 Step and other support groups to use our building in the evenings. You wouldn’t believe how many of those people were shocked that a church would let them in the door. After Easter of 1988, I began a 12-week sermon series on the 12 Steps. We were averaging around 200 people in church each week. The first Sunday of the new series, the empty seats began to be taken. Something supernatural happened in that season that still continues to this day. The people kept coming. We kept running out of space, starting new services, making parking agreements with surrounding businesses, and praying they would not change their minds. Because my passion is aimed at those furthest from God and the ones most skeptical of preachers, I personally started a Sunday School class for “12 Steppers” called the “Open Door Class.” To make my point about everyone being welcome, I literally removed the door from the hinges. The class was full its first Sunday. The honesty of the class meant there were some using very foul words. I put that door back on its hinges! It also occurred to me that I may need to soundproof the room! But those in the class could not believe they were truly welcomed as they were. Many of them are some of our stellar Christ-centered leaders today. So many people are stunned to hear that in 1985, there was no particular strategy or focus. We just decided to do the next right thing and remove every possible barrier that kept people out of the church. Let me make something clear: I am forever indebted to the godly men and women who made up the governing board of our church. They had hearts bursting with compassion. They were not afraid of anything. They believed Jesus had set the tone and shown us the way to love people. They actually believed and pursued the Great Commission and the Great Commandment. They held nothing back. As of 2019, we are still trying to figure out how to make room for those finding their way into our church family. A coach is only as good as the players he recruits and puts on the team. Little did I know that when I became the coach--a first-time-ever coach, a coach who didn’t want to be a coach, and coach who had no experience being a coach--I had some Heisman Trophy kind of players who actually coached me without telling me. And they played to win. As we celebrate 60 years in 2019, I find the bench is still full of the finest people a pastor could ever dream of leading.